A great art project to do when you are studying insects, or just to have fun is to take a 12" x 18" (30.5 x 46 cm) piece of construction paper and fold it in half long-ways. Then write the students' name in cursive along the fold. (They may want to use their last or middle names if their name is short). Then cut along the outside of the letters. Cut out any loops also. Unfold the paper and you have an "insect" ready to decorate and color. Fold 12" x 18" (30.5 x 46 cm) White Drawing Paper (or light color). 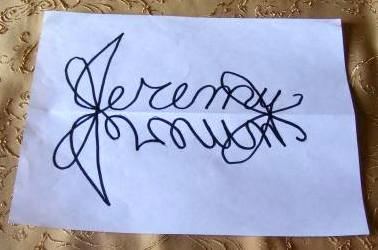 Open and write name on fold in cursive with Ebony Pencils (go over lines). Fold and rib to transfer name to other side. Open - outline with black markers - color with choice of medium. Another way to transfer is after the name is written in cursive, the paper is folded and held up to a window. The reverse side is then traced and you have an image similar to the picture on the left. The symmetrical design can then be filled in with markers and/or Crayons to make a colorful design. This can also be used for the Name Insect project. Instead of cutting it out, the entire paper is colored. The background could serve as the home of the insect or area where the insect is sitting. Nametag Art- Another similar project is described. Name Lesson Ideas- The middle school version of this lesson with new twists. How to Draw Insects (How to Draw (Dover) - Shows would-be artists of all ages how to create accurate images of a grasshopper, monarch butterfly, tarantula, caterpillar, cicada, praying mantis, walking sticker, scorpion, carpenter ant, Japanese beetle, inchworm, centipede, termite, and 17 other insects. Draw Insects - Drawing lessons for over 80 insects and other creepy crawlies such as millipedes, ticks, and spiders are featured in this carefully constructed drawing book. All of the examples are done in pencil. A discussion of materials needed is included in the preface. Beasts! : How to Draw Fantastic Predators - With paper and pen, artists can create hundreds of their own scary creatures in the comfort of their own homes, with the shades drawn and the doors locked.